You're probably familiar with the concept «volatility». If not, we recommend you to get more information on the subject before reading this article. The present article is about the most volatile currency pairs in the Forex market in 2019. According to the definition of volatility, we should note that it tends to change in the course of time and is not a constant. If you have ever traded in the Forex market or at least watched price movements from the sidelines, you might have noticed that price moves non-linearly on the chart. There are times when price merely makes no headway or moves within a very narrow range. If this is the case, people say that there is a low volatility in the market. On the other hand, when major economic data releases or officials speak, the market price makes sharp and strong moves. If so, it is said that there is an increase or even a spike in volatility. In order to visually illustrate the non-constant nature of volatility let’s look at the Forex Volatility Calculator – http://investing.com/tools/forex-volatility-calculator. All you need to do before you start using the tool is to enter time period, over which you need to measure volatility, in weeks. 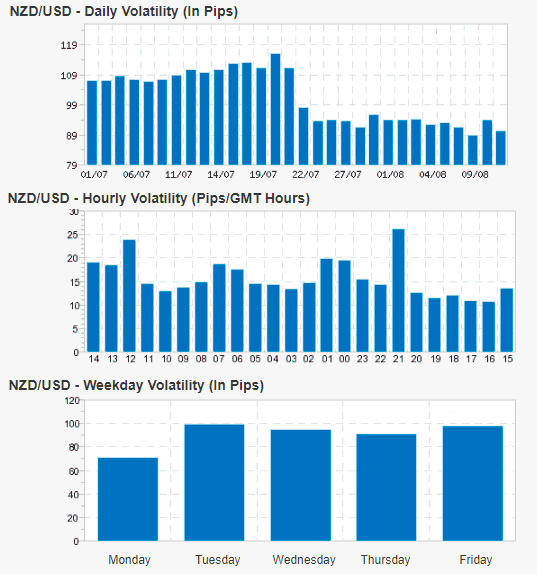 These diagrams show an average volatility of NZD/USD currency pair for every day since July 1. It also shows an average weekly, daily and hourly volatility. Based on all those 3 diagrams we can make a conclusion that volatility tends to change during any period of time. The hourly volatility diagram for NZD/USD, where peaks of volatility can be seen at 12 and 21 o’clock (GMT time), is of a particular interest. It fully coincides with the time of economic data release for the USA and New Zealand. It supports the thesis on the increase in volatility during major economic releases referred to at the beginning of the article. 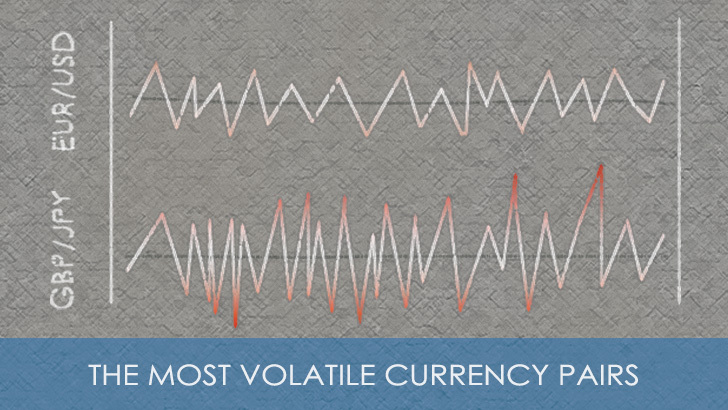 Change in volatility can be observed in all currency pairs. You can select the required currency pair by yourself and get the statistics of its volatility over different time intervals. What Does Volatility Depend On? What does volatility of any currency pair depend on? The main reason for volatility is liquidity. A classic rule states that: the higher the liquidity, the lower the volatility, and vice versa. In fact, liquidity is the amount of supply and demand in the market. It means that the larger the supply and demand, the harder is to get the price moving. It can help you to protect yourself against an unexpected market activity. For the purpose of study let’s take 7 major currency pairs, cross and exotic currency pairs, and draw up a comparative table on the basis of the obtained data. 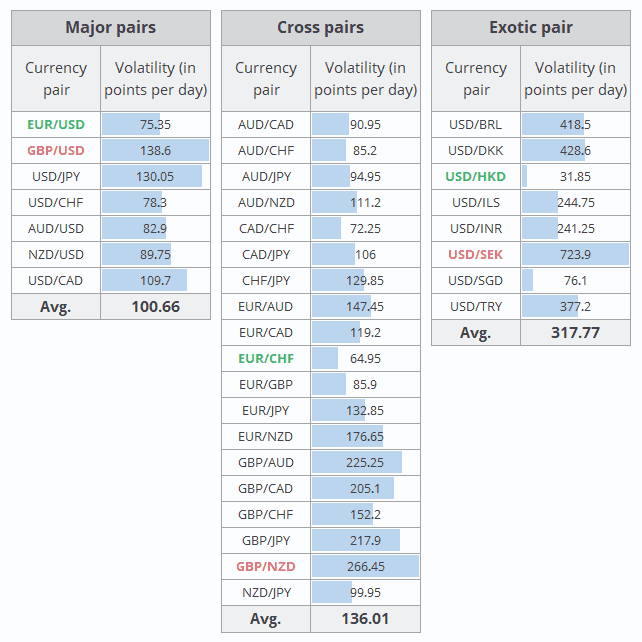 The Most Volatile Currency Pairs – The table shows that today the most volatile Forex pairs are exotic ones. Namely, USD/SEK, USD/BRL, and USD/DKK. All of them move for more than 400 points per day on average. The volatility of the major currency pairs is much lower. Only GBP/USD, USD/JPY and USD/CAD move for more than 100 points per day. EUR/USD turned out to be the least volatile currency pair. As for the cross rates, GBP/NZD, GBP/AUD, GBP/JPY, and GBP/CAD refer to the currency pairs with highest volatility. All of them move for more than 200 points per day on average. EUR/CHF, CAD/CHF, AUD/CHF and EUR/GBP differ like less volatility Forex pairs among the cross rates. The amplitude of their movements doesn’t exceed 90 points per day. The reader may conclude on the basis of such statements that trading in exotic currency pairs or cross rates promises large profits. However, it isn’t quite so simple. Indeed, the range of exotic pairs’ movements is much broader than that of the major ones. However, such a high volatility is a result of low liquidity, and trading in low liquidity currency pairs carries particular risks for a trader. The fact is that various technical analysis techniques might not work in such situations. That is, if you decide to trade, say, in USD/SEK or GBP/NZD, your analysis may not work as effectively as, for example, when trading EUR/USD. Also technical analysis patterns might generate false signals. This is because the psychology of the market behavior in its most liquid form makes up the backbone of technical analysis. If the liquidity of a trading instrument is lower, the validity of technical analysis comes under question. The second problem a trader can face when trading in volatile financial instruments is a wide spread (additional trading expenses). Of course, we shall never advise you not to trade in currency pairs having low liquidity. However, our task is to warn inexperienced traders and newbies that the risk of such trading is higher than that of trading in classic currency pairs.